Euclid was a Greek mathematician, known as Euclid of Alexandria, and often referred to as the “Father of Geometry.” In Greek, his name means “Good Glory,” as Euclid is the anglicized version of the Greek name. He is famous for the treatise Elements, which is considered to catalog and place much of Greek mathematics on a firm foundation. Considered one of the most influential works in the history of mathematics, Euclid’s work was the main textbook for teaching mathematics up until the 20th century. In Elements, the author deduced some geometrical principles based on a small set of axioms. Other themes approached in his work include conic sections, perspective, number theory, spherical geometry and rigor. There are few references to Euclid’s life. His education and even birthplace are still in dispute. Some historical references were written by Pappus of Alexandria and Proclus centuries after Euclid’s death (265 BC). 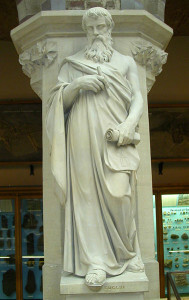 Born in approximately 325 BC, Euclid taught mathematics and was the founder of the Alexandrian School of Mathematics. Euclid’s Elements is still recognized as one of the most prominent books on mathematics in history. In it, he pulls together materials from others who studied and researched mathematics before him. He compiled much of that information along with his own original thoughts and research in Elements. It includes information about topics like number theory, algebra, and geometry. Some say that Abraham Lincoln admitted he felt greatly influenced by three works: William Shakespeare’s works, the King James Bible, and Euclid’s Elements. It is considered an authoritative masterpiece, laying out carefully and systematically propositions (what can be proven) and axioms and postulates (what can be assumed). The book includes the basic rules of logic, everyday geometric objects’ precise definitions, and the rules of arithmetic. Although being an amazing work in the history of mathematics, it still has its critics. For example, Bertrand Russell, a British philosopher, calls one of Euclid’s propositions “a tissue of nonsense.” However, Euclid’s defenders state that the only issue he had is that he did not study Russell. Euclid had a few works that survived throughout the years. For instance, On Divisions of Figures was a work that focused on geometrical figures. His work Catoptrics was about mathematical theories of mirrors. There are some other works that have been lost, but there is some record of them, including Conics, Porisms, and Surface Loci, among several others. As one of the most well-known mathematicians of all time, there are many forms of math named after him, including Euclidean geometry, the Euclidean number, and the Euclidean algorithm.